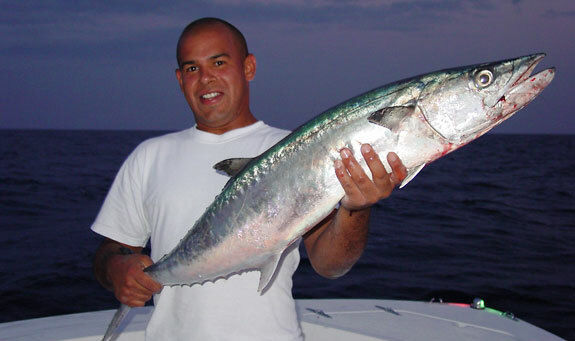 Kingfish are a very abundant gamefish off the coast of Anna Maria Island. Kings have heavy bodies with a mouth full of razor sharp teeth. They have an elongated body that is green on top with mostly silvery and unmarked sides. Their lateral line is straight with 45 degree angle drop in the center of the body which distinguishes them from Spanish mackerel whose lateral line is straight throughout their side. Kings are extremely fast and provide strong and sizzling runs. Trollers generally choose heavier outfits with lines testing from 20-40 pounds. Capt. Tom Chaya prefers to catch kings from anchor or drifting. Fishing with pilchards or cigar minnows and chumming hard produces the most activity. The bigger the bait will usually provide bigger fish especially near windy cold snaps. School fish may run from 5-15 pounds. Plenty of individual fish may run in the 30-50 pound range. Any reel with an excelent drag system is a must on the bigger fish. Runs may exceed over 200 hundred yards. Their food value depends on the individual. A kings flesh is rich with omega 3 oils and is excellent grilled or smoked.